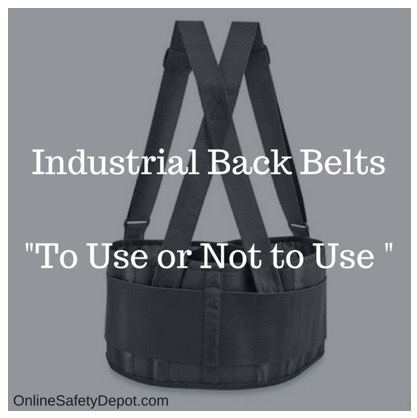 For decades individuals, organizations and agencies have engaged in research and discussion/argument regarding the benefit, real or imagined, of industrial back belts to prevent low back injuries, which accounts for 20% of all workplace injuries. As reported in multiple articles and discussion based forums, the proposed mechanisms for low back injury prevention center around the belts ability to increase intra-abdominal pressure that helps keep the spinal column more stable through reduced movement, serves as a reminder to the person wearing the belt that they are to lift properly according to accepted proper lifting biomechanics, and that the belts compression on the spine helps reduce the forces that are applied directly to the spine. Therefore, this discussion must begin with an understanding of some basic principles related to the spine and trunk (sometimes referred to as the core). While one of the important functions of the spine is to provide us with movement, its primary function when performing upper and lower extremity movements or activities is to limit movement. This limiting function to the spine provides a firm, stable base or foundation from which many of the muscles of the extremities pull against to produce forceful extremity movements. The muscles that help stabilize the spine and thus minimize spinal movement, consist primarily of the deep segmental spinal muscles, the abdominal muscle group, the low back extensors, etc. While the deep segmental spinal and low back extensor muscle groups get worked/conditioned quite a bit by simply keeping us upright throughout the day, the abdominal muscles don’t get much work or conditioning as part of most people’s daily routine. Therefore, these muscles must be consciously worked as part of a program to strengthen them or they will weaken and lose their ability to help contribute to spinal stabilization. Many individuals, including athletes, can confuse the difference between athletic performance and health. For example, sit-ups and crunches will give a person strong abs, but often at the expense of the integrity of their intervertebral discs. This repetitive flexion and extension of the spine is a potent mechanism shown to breakdown the discs leading to bulging or herniated discs and the associated back pain and radiating pain down the legs (sciatica). With this understanding I submit that what is outlined below is a more common sense and effective way to reduce low back injury while at work or at home or on your field of competition – without the use of a back belt. Train your work force in proper muscular conditioning techniques for all the muscle groups that are associated with providing support for the spine. Remember, strong muscles are much more resistant to injury than muscles that are deconditioned, and most injuries can be linked to a weakness somewhere in the musculoskeletal system. Train your work force in proper lifting biomechanics that reduce unnecessary loads while also promoting musculoskeletal conditioning by the activity itself – conditioning that may be inhibited or reduced if a wearing an industrial back belt. Train your work force in the maintenance of proper posture, while sitting and standing, including the co-contraction of all muscles that support the spine to create a pneumonic type of cylindering around the spine. Finally, provide some time during the work day for your workforce to engage in these prevention strategies, offer some type of incentive for compliance at work and at home, and hold employees accountable for implementing their training at their work stations. A properly trained and conditioned body, coupled with a reduction of the risk factors of low back injury through proper biomechanics, is the most effective intervention to reduce low back injuries. Add to this a reward and recognition system for compliance and actual injury rate reduction and you have a well-functioning program that will yield the results overtime.